- Mid-South Superdome Extravaganza (June 13, '87) = The Enforcer & the Terminator lost to the Freebirds (Terry Gordy & Michael Hayes). - NWA WrestleWar '89 (May 7) = Gilbert was pinned by the Great Muta. 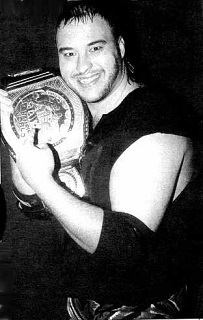 - USWA Tag-Team Title Tournament (January '93) = Gilbert & Tony DeNucci lost in the first round to Brian Christopher & Mike Miller. The Harris Brothers won the tournament. - W*ING Heavyweight Title Tournament (July '93) = Freddy Krueger fell to the Masked Superstar. Crash the Terminator won the tournament. - ECW Tag-Team Title Tournament (August '93) = The Dark Patriot & Eddie Gilbert defeated Tommy Cairo & JT Smith (via DQ), the Super Destroyers, and Sal Bellomo & the Sandman to win the tournament. - ECW UltraClash (September 18, '93) = The Dark Patriot won a "Scaffold" Match over JT Smith. - Mid-South November Blast (November 15, '93) = Gilbert & the Dirty White Boy won, via DQ, over the Moondogs (Cujo & Spike). - Mid-South Memphis Memories (March 7, '94) = Doug & Eddie Gilbert, along with Terry Funk, lost, via DQ, to Brian Christopher, Jerry Lawler, & Austin Idol. Later on, Doug competed in an "Elimination" Match, which was won by Jerry Lawler. - USWA Tag-Team Title Tournament (April 23, '94) = Doug Gilbert & Tommy Rich lost in the first round to the eventual winners, Eddie Gilbert & Brian Christopher. - Mid-South Memphis Memories II (June 10, '95) = Gilbert & Tommy Rich defeated Brian Christopher & Bill Dundee and Jerry Lawler & Jimmy Valiant, before losing in the finals of the Best of Memphis Tag-Team Tournament to the Fabulous Ones. - USWA Tag-Team Title Tournament (August 28, '95) = Gilbert & Tommy Rich lost in the first round to Brian Lee & Axl Rotten. PG-13 won the tournament. - NWA 1st Annual Eddie Gilbert Memorial Brawl (February 3, '96) = Gilbert pinned Jerry Lawler. - WWF Royal Rumble '96 (January 21) = Gilbert competed in the Royal Rumble, which was won by Shawn Michaels. - USWA Tag-Team Title Tournament (June 17, '96) = Gilbert & Tommy Rich defeated Men On A Mission, then fell to Brickhouse Brown & Reggie B. Fine. Flex Kabana & Bart Sawyer won the tournament. - NWA 2nd Annual Eddie Gilbert Memorial Brawl (April 12, '97) = Gilbert beat Buddy Landell. - IWA Mid-South King of the Death Match Tournament '97 (October 21) = Gilbert won over Ox Harley and Mad Man Pondo to reach the finals of the tournament. However, due to injury, Gilbert did not compete in the final "Three Way" Match, which was won by Ian Rotten. - NWA 3rd Annual Eddie Gilbert Memorial Brawl (February 28, '98) = Doug & Tommy Gilbert defeated Buddy Landell & Dory Funk Jr.
- NWA 50th Anniversary Show (October 24, '98) = Gilbert, Steve Corino, Lance Diamond, & Rik Ratchet won a "Steel Cage" Match over Stevie Richards, Dead Man Walking, & the Pitbulls. - IWA Tag Team Title Tournament (February 23, '99) = Freddy Krueger & Shinigami lost in the first round to Jason the Terrible & Leatherface. - Memphis A Fight for a King (November 29, '03) = Gilbert & Dutch Mantel were beaten by Brian Christopher & Jerry Lawler. - Memphis Slam Jam (April 23, '04) = Gilbert lost a "Lumberjack" Match to Bill Dundee. - Memphis Throwback Night III (October 30, '04) = Freddy Krueger competed in a "Battle Royal", which was won by Chucky.